Wedding place cards, sometimes also called place setting cards, ensure your guests know where to sit when you are having a formal dinner wedding reception. In addition to being a reliable method to seat your guests, wedding place cards help make guests feel welcome and pleased that they have a specific place at your wedding reception. 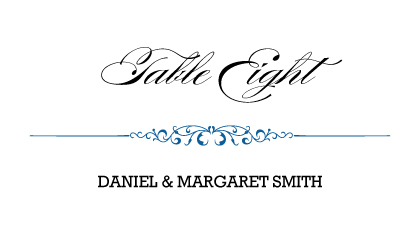 Each guest, or couple, should receive his and her (or their) own place card. A beautiful wedding place card will also serve as a wedding keepsake for guests to remember your wedding. 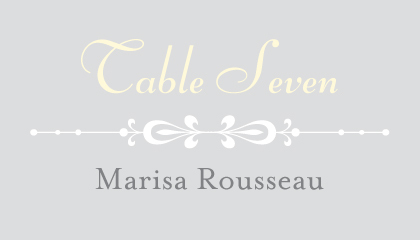 LookLoveSend has an extensive collection of place card designs that you can order either as stand alone or as part of your unique wedding invitation suite. Whether your wedding day style is traditional, modern, whimsical or some unique blend of styles, our designers have created entirely original, artistic designs to suit different tastes. Choose place cards as part of your complete set of wedding stationery, from wedding save the date cards through wedding invitations to wedding thank you cards. Create your wedding place cards in four easy steps. Choose from one of our hundreds of designs, select a font style and color palette, enter your message, and insert any personalized images. In a few quick clicks of your mouse, you can preview your place cards. Your wedding place cards will be printed on our own in-house, state-of-the-art printing presses, managed by our professional print team who guarantees a flawless, crisply printed product. LookLoveSend also guarantees that you will love our high-touch customer service. Our in house designers and printers will work with you to make sure your wedding place cards are perfect. We print only on the highest quality papers and card stock, so you can trust all your wedding stationery needs to us. LookLoveSend is committed to making all components of your unique wedding invitation as special and unique as your wedding day deserves to be.